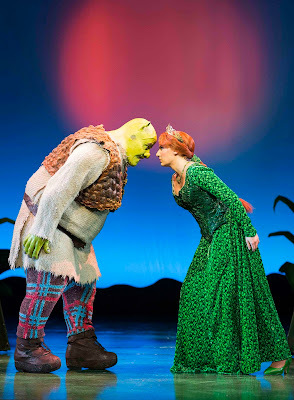 It’s hard to believe that it’s 15 years since the first Shrek film exploded onto our cinema screens, teaching us that ogres are like onions, that beauty and bravery have nothing to do with appearance, and that dragons and donkeys might make a surprisingly good romantic match. Since then there have been three sequel films, numerous television holiday specials, and, since 2008, this stage musical adaptation, which combines the story of the first film with a range of new songs and some rather spectacular dance routines. The set at the New Wimbledon Theatre is fantastic and visually stunning, beginning with an open storybook, through which Shrek steps to narrate his childhood and how he came to live on the swamp, a framing which then draws back to reveal a fairytale wood, rich in detail and inhabited by a range of amazingly-costumed fairytale creatures. 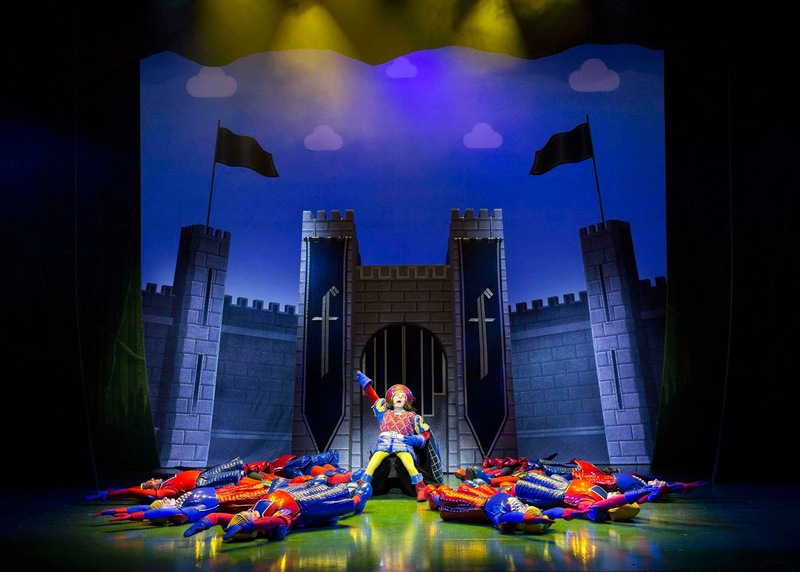 As the story progresses, the show brilliantly and creatively stages all of the key set pieces of the film, from the clinically clean ‘perfect town’ of Duloc to the lava-surrounded dragon’s castle where Princess Fiona is imprisoned, and even features a magnificent War-Horse-style puppet dragon, which soars above the heads of the actors and drew several gasps of amazement from the children in the audience. Whilst the show is filled with physical comedy and fart jokes to keep the kids happy, the script also includes plenty of double entendres for adults to snigger along to (although at times it felt like these were emphasized slightly too heavily for a family show). Gerard Carey as Lord Farquaad plays up every risqué comic element of his diminutive stature, and almost steals the show with his dance routines, performed on his knees whilst using a pair of prop prosthetic legs (often clad in gold tights). Dean Chisnall is quietly endearing as the stolid Shrek, who dreams of finding his own place in the ‘Big Bright Beautiful World’ he feels distanced from, and Brontë Barbé makes an energetic Princess Fiona (although I was disappointed to see that the martial arts skills she displays in the film have been cut out here). Idriss Kargbo has some great comic lines as Donkey, but the role is perhaps not written as successfully as in the film: at times I felt what should have been a leading comic turn was rather overshadowed by the show’s extended emphasis on Lord Farquaad. The real drawback of this show, however, is the songs – something that’s such a key element of a successful musical. Whilst the musical numbers are undoubtedly very well-staged – there’s a fantastic moment in the second half when Princess Fiona sings about being a “morning person”, accompanied by a chorus-line of tap-dancing rats ­– it says a lot that the two most memorable and energetic numbers have been lifted straight from the film (the childlike, singsong ‘Welcome to Duloc’ performed by a chorus line of wooden animatronic dolls, and the pleasingly raucous closing number ‘I’m a Believer’, first made famous by The Monkees). It’s a shame, as the sweetly touching nature of the story, the attention to detail in the set and costumes, and the energetic performances by the main cast really warrant some spectacular tunes to bring everything together, but, unfortunately, the songs never quite come off. Despite this, it was clear that the children in the audience were thoroughly spellbound by the beautiful staging of this well-known tale, and the show’s emphasis on the importance of inner beauty and of embracing differences is a message that is sweetly and yet powerfully conveyed. If you’re looking for a visually stunning show to take the whole family along to, this is definitely one to watch out for.